So after feeding breakfast to the dogs (Nupro today on their kibbles), I spent a half-hour grooming (mostly TD, of course). Then hunted down my weightpull equipment (could not find the little tire, but found the big tire, the sledge, and the harnesses, so good enough. Then we started weightpull tryouts. Supplements. I rotate what goes on kibble. It’s not a hard-and-fast rule, but in general, I vary it by day, so they will get kibble and one of the following: Nupro, ProBios, DE (diatomaceous earth), wild-caught salmon oil, a whole raw egg, fresh fruit (generally bananas, apples, blueberries, or pears), or raw veggies (squash, cucumbers, carrots, pumpkin, or whatever is surplus in my garden – no onions or peppers.) Sometimes I’ll find a loss leader or screaming sale at the grocer on fresh produce, eggs, or chicken quarters, like sweet potatoes (which I cook first) around Thanksgiving. Sometimes they get raw meaty bones instead of kibble+, usually chicken quarters. I think they like those days best. 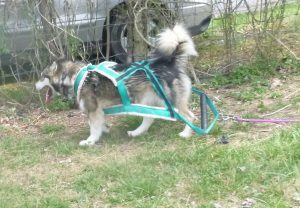 Let the first dog out of his kennel to zoom around the yard while I pulled all the weight-pull harnesses from the locker and hung them on \ the downhill kennel perimeter fence. Once she was calmed down (a bit), I intro’d jer to a weightpull harness. Weightpull harnesses come in a wide variety of makes and sizes. Not all are created equal. There are competition harnesses and practice harnesses and if you have one dog, get the best harness you can, you won’t regret it. I have dogs who range in size from 50-100# and dropping $75-150 per custom competition harness is not feasible on my budget. Sometimes they share harnesses. Sometimes I’ll juryrig a neck fit on a good harness even if the body is a little long. A simple ziptie on the nape of the neck will fit a large harness on a medium neck. I also have a range of sizes of practice harnesses. These are not competition harnesses and don’t hold up to the higher weight requirements. There’s not enough padding on the neck, through the body, or on the bar. The webbing isn’t wide enough. And they aren’t long enough through the body. But check the necks on the above harnesses — fleece padding on 1″ webbing. Now check the necks on the competition harnesses below. These harnesses have 2″ webbing, the ones on the right are foam and taped. Even the ones on the left are 2″ fleece and faux fur padding. My dogs pull better and easier in these harnesses than the narrow-webbing practice harnesses. Even though we don’t pull big weights in training. In fact, in training, we never pull over 50 pounds. Then how do you pull a ton (a literal 2000#) in competition? Like 68# Storm did with WDA in Morristown? Or 2200# like 92# Tom T. did with the 3rd Annual Southern Exposure in KY? Well, we cross-train. Marathon runners don’t practice by running 26 miles every day. Weightpull is the same. We practice the technical & mental skills of starts and stops. We practice them a LOT. We do cardio with long hikes. We do flexibility, both physical and mental, with rally-obedience. And we do strength training with weightpull. But we don’t pull more than 50#, but we pull it for 50-foot intervals, over and over and over again. We’re also not going to Nationals, so take that with a grain of salt. But my furry dogs have beat out the bullies. Much to their owners’ chagrin. We fit the dog in a harness. We start slow and give the dog every chance to get familiar with the new stuff and figure out how to do this new thing with encouragement and praise. You can’t push a rope. Every step is successful before we ask for the next step. However long it takes. However much encouragement it takes. However many tries it takes. So today, I let Mensa out of her kennel to zoom around in the big yard. Walk down to the setup where I have the harnesses over the fence and the DRAGS already set up. Guess that Mensa wears a 70# harness. Wrong, she has a fat head. Get the 80# harness. Show it to her. Let her sniff it all over, and the gear, have patience, this is her introduction to weightpull I want it to all be happy. And the harnesses will smell like other dogs. Mensa wearing a weightpull harness for the first time. When Mensa comes over to me after her investigations, she gets praise, she gets pats. 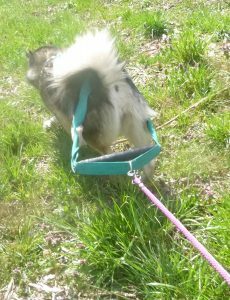 And I grab the harness scrunched up with my thumb through both the neck and body of the harness (where her rear legs will go). So that when it goes over her nose, it does over in one fell swoop. I tell her, LET’S GET DRESSED. I stand over her, which is a little confusing for her and I let her sort that out, holding her with my knees. Then I tell her NOSE. And put the gathered harness over her nose, both the neck and body opening (will try to get a picture of that tomorrow). Then I run a hand down each leg and slip her front leg through the front leg hole as I tell her FOOT each time. Then I pull the harness down her body and tug on it, saying LINE OUT. Even though she doesn’t have a clue what that means, I tell her so she learns the ritual. Mensa leaning into her weightpull harness. I hook the 10-foot horse leash to the O-ring on the back of the harness and tell her LET’S GO. At first we’re just walking. And since it’s new, she’s sticking to my side like we’re loose-leash walking. That’s fine for now. Without reminders or corrections, she’s going to go out front and that’s what we’re looking for. When she goes out front, she checks back to see what I’m doing and I say, GOOD GIRL. She keeps walking, and she walks faster than I do, so eventually the leash goes tight and the harness pulls down her body and across her chest I give her a new command HUP. This command works for every instance when I want a harnessed dog to lean into the harness, both weightpull and faster sports like sledding/carting/scootering. 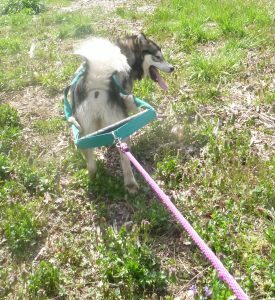 I make sure we head uphill, because there’s something about going uphill that makes a sled dog lean into her harness. We’re headed uphill, she’s leaning into the harness and the leash is tight, so she gets a happy HUP! Success! We go around the yard back to the drags and I hook her to the sledge with the truck tire riding on it for weight. The sledge is 5′ long and plastic so it has a pretty good glide across short grass. Mensa with the sledge weighted with the truck tire. Once she’s successful at pulling that around the yard, I dump the tire out and hook to that. There’s a lot, I mean a lot, of friction between a truck tire and grass. So I’m not asking for 50 feet to start. I just want her to know she can do it, so I set her up for a 5-foot pull. Nothing more than that. She’s named Mensa because she has to think things through. But once she does, Katy Bar the Door! So I set her up for the tire pull. Walk back 5 feet and say, Mensa, HUP! And bend over and clap and do everything I know how to get her to come when called. When all I get is flower sniffing, I know she’s about at the end of her thinking-things-through phase. So I get on my knees and say, PUPPY, PUPPY, COME! Which is a command every single Wayeh puppy has learned since the whelping box. And it works! So she gets tons of praise, tons of body scratches, tons of affection and hugs, and happy noises. And we’re done. Always, always, always end your training on a high note. Doesn’t matter what the success was, celebrate it. Dogs don’t compete, they work because they please you doing it. They work because it answers some instinct in them. But if their people turn it into something less-than-fun, then they will perform less-than-fun. Take Mensa back to her kennel for fresh water and rest, and bring out Yosha, the young turk on campus. Next. Hook him to the drag sledge. He’s magnificent. Then the tire. Even better. The boy likes it, leans right into the harness (note it’s a wide-strap, padded competition harness) and he’s grinning the whole time, no worries. Note: in the last picture how the neck of the harness lies right on his shoulders. And it’s long enough not to interfere with his rear legs when he gets that extreme rear drive going. Bayou testing out her gymnastics training. Now it’s Bayou‘s turn. She does not take to it automatically like Yosha did right out of the box. She is not happy with the whole harness experience. And success at that step takes longer. Everyone is different. Everyone advances at a different pace. That’s OK, too. Because once she does get it, there will be a big celebration. But when we headed up hill, she did stretch out front. And I told her, GOOD GIRL! Bayou looked back to check on me, Are you sure? That’s when we had our big celebration and undressed her and put everything away for the day. End on a high note. Not just for the dogs, but for you as well. Next we’ll start weightpull with Emmer, Gypsy & Yuki. But we’ll start earlier in the day, because it got WARM quick this time of year. Q: When in the harness and walk out for walks my concern is that M. will learn to pull when out for walks if I allow him to pull while wearing the harness. He already pulls slightly. Any suggestions for me on this? A: Absolutely. I am cross-training 3 sports at the same time. Backpacking, weightpulling, and rally-obedience. In weightpulling they MUST pull, in the other two they must NOT pull. It’s very very simple answer. The owner MUST MUST MUST be consistent in training. Tight leashes on the collar are NEVER allowed, not for one second, not for one step. Doesn’t matter what collar they are wearing. No tight-leash allowed on the collar. Don’t confuse the dog by allowing him to sometimes have a tight leash on the collar and get away with it. Correct it 100% if the time and you will have compliance 100% of the time. But if you correct it most of the time, you’ll have compliance most of the time. Conversely, when the leash is hooked to the harness with tension, they should be pulling every step. They know the difference between tension on the collar and tension on the harness. They might push your boundaries a little to see if you really meant it. But if you are consistent, they will be. But this requires YOUR consistency first, before you get their consistency. And that’s the hardest part of training. In other words: if you want your dog to jump up and give you hugs because you like it, you can’t be dismayed when they do it when they are muddy and you are in your church clothes..You have to set boundaries. One boundary I have is no leash tension on a collar, not one step, not one second. This is just one reason why I have that boundary. The other is that an unexpected yank on the collar may mean a really bad fall for me. What do I do with leash-tension on a collar? 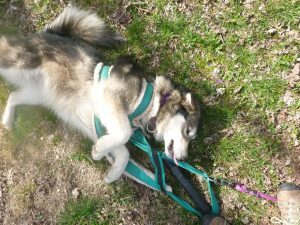 When beginning loose-leash training, I give a verbal “agh” and immediately reverse direction with a 180 degree turn. They want forward momentum, they get backwards momentum. They should be paying attention to ME first, not visual stimuli. It sometimes takes a while to get to the mailbox. The first time. They figure it out very quickly if you are 100% consistent. If they have already been taught this and just need a refresher, I just give a verbal “agh” and stop. When the DOG moves to release the tension on the collar, we move forward. If the dog doesn’t get the refresher, we got back to 180-degree turns to remind them. But the “agh” is always the same. The level of correction may escalate from stopping to reversals. Loose leash on the collar. Pulling on the harness. The dog absolutely knows the difference between his neck and his chest, where the tension is.